Entries tagged with “Natalie Portman”. 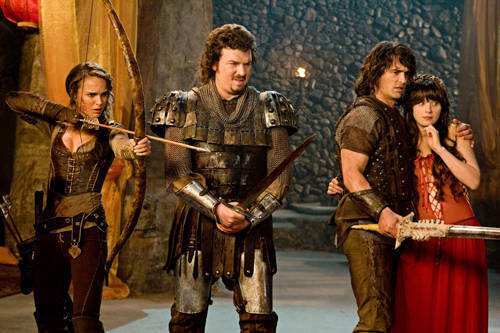 Silliness reigns in David Gordon Green’s foul-mouthed fantasy spoof Your Highness, co-written by and starring Danny McBride, one of the more unique comic personalities working today. It’s an almost deliberately messy and imperfect movie, but I laughed quite a bit, perhaps because I have a soft spot in my heart for the vintage ’80s fantasies its riffing on. Read my mild defense of this proudly dumb comedy over at Film Journal. The key to appreciating (if not necessarily enjoying) the unnerving ballet psychodrama Black Swan is coming to terms with the fact that director Darren Aronofsky isn’t making Tchaikovsky’s Swan Lake—he’s making Roman Polanski’s Swan Lake. The influence of the controversial Polish filmmaker’s work looms large over this film, particularly his vintage ’60-era thrillers like Rosemary’s Baby, Knife in the Water and Repulsion. Indeed, the latter film is the most obvious influence on Black Swan. Released in 1965, Repulsion (which was Polanski’s first English-language feature) starred Catherine Deneuve as a troubled young woman so frightened of the world in general and men in particular that when her sister leaves her alone in their apartment for a week, her internal demons manifest themselves as terrifying hallucinations that eventually push her over the edge into madness. Even today, Repulsion remains one of the great “Don’t watch it when you’re home alone” movies, as Polanski turns a nondescript apartment into a cabaret of horrors.